Who knew I held such sway in Hollywood? Because whaddya know, that is the exact plot of the Matt Reeves-helmed summer blockbuster Dawn of the Planet of the Apes, the second installment of the new reboot of the remake of the 1968 original Planet of the Apes. I expect the royalty checks to begin flowing in any day now. Who can ever forget the Charlton Heston classic (from a screenplay written by—trivia alert!—Rod Serling) and that legendary, jaw-dropping ending, possibly the greatest last five minutes in cinema history. I was obsessed with those movies as a kid: Planet of the Apes, Beneath the Planet of the Apes, Escape from …, Conquest of …, and Battle for the Planet of the Apes. I was so nuts I even loved the 1974 bomb TV series. And we won’t talk about the 2001 Marky Mark remake which everyone pretends never happened. The only reason it’s remembered today, if at all, is because it was on that film that director Tim Burton ditched his longtime girlfriend Lisa Marie to take up with the woman who would feature so heavily in his later films, Helena Bonham Carter. 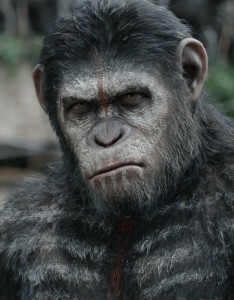 In 2011, the powers that be decided to give the whole simian-centric franchise another go with Rise of the Planet of the Apes. This series reboot featured James Franco as a chemical biologist who unknowingly invents a drug giving apes the power of speech while unleashing a flu destined to destroy the human race. Caesar (Andy Serkis) is smarter than the average chimpanzee and he does not suffer fools gladly. The movie spends some time toggling back and forth between both worlds, examining what exactly it means to be “human” as well as the possibilities and limitations of civilization. This really is the best part of Dawn and what sets it head and shoulders above most summer movies this season. There are interesting ideas which the screenwriters take time to explore and develop by comparing and contrasting these two bands of primates. The creative team also has some compelling things to say about fear of “the other” and the mammalian propensity toward violence. The inter-dynamics of both groups get a good looking-over and while the points are never pushed, it’s refreshing to stumble across a movie with something intelligent to say. But listen to me—I’m making this cash-cow franchise sound like a community college summer class in Ethics. You don’t need to worry about any of that. This is still a Hollywood movie and most of the intelligence will be drained away to make space for the exploding buildings and hail of gunfire—which Dawn regrettably, if predictably, has in abundance. Wait, don’t shoot! 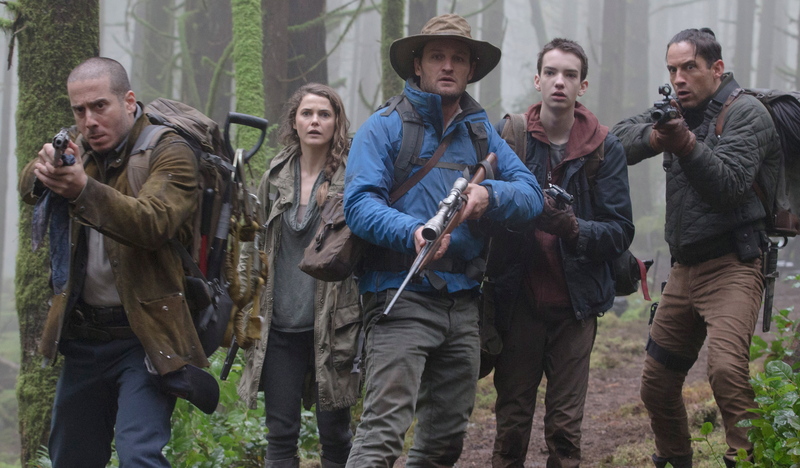 Some of the humans, led here by Malcolm (Jason Clarke, center) want to keep things cool … but you know how that will turn out. It didn’t bother me that the writers needed to invent trumped-up conflict. (If they hadn’t, we could all go home with our ear drums intact.) It also didn’t bother me that some of the monkeys bypassed millions of years of natural selection and, overnight, sprouted the sort of larynxes and hyoid bones necessary to produce speech. I mean, if you’re willing to believe Franco as a scientist, you’re willing to believe anything. What made me nuts is that all of the apes have grown opposable thumbs! Is it a miracle? Or is it just a Hollywood miracle? It turns out to be the latter. As the writers must have realized during a script development meeting, without those miraculous thumbs, the apes wouldn’t be able to ride horses down the streets of San Francisco while firing two machine guns (one in each paw) simultaneously. And, judging from the reactions around me, those moments of impossible carnage are what sell this movie to the target audience. With the exception of the commercial for a video gaming system which ran before the film, this was the only time my fellow movie watchers were completely quiet. 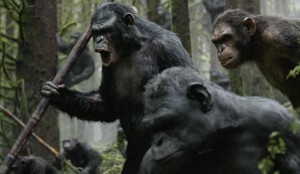 Koba (Toby Kebbell, left) is the kind of ape who screams loudly and carries a big stick. 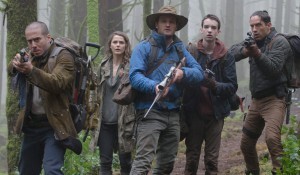 Once the “plot” kicks in, Dawn plays out like a John Wayne movie with skirmishes and sieges, internecine squabbles, devious traitors, and tarnished but redeemed heroes. You can pretty much skip this part because it’s nothing you haven’t seen before. And I mean that. In Dawn, the male apes run the colony, make the laws, kill the elk, and plan the attacks. The females stay at home and raise the ape-lets, when they’re not making the cutest little beaded tiaras to wear around the compound. Reeves and company may have imagined a world turned upside down—but it’s still one where boys have the guns and the girls have the jewelry! Ted Hoover is a writer and critic based in Pittsburgh. Photos by WETA and David James; all images © Twentieth Century Fox Film Corp.